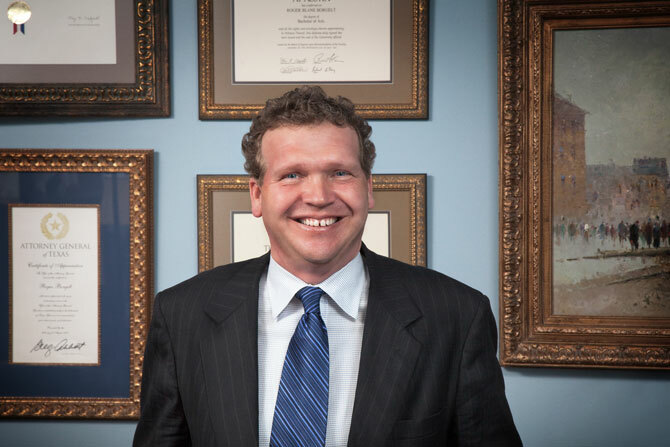 ROGER B. BORGELT is a highly regarded Austin lawyer with 25 years’ experience in the practice of environmental, energy, administrative, utility and professional licensure law. He is well-known for his representation and results in often complex and contentious areas concerning annexation matters, zoning and permitting issues, land use and local government law. He also advises officeholders and candidaties on campaign finance and high profile election law matters, as well as individuals and businesses in various disputes, including in the area of deceptive trade. He is listed in Best Lawyers in America® 2018 and Texas' Best Lawyers for the eighth consecutive year since opening his own law firm in 2010. His firm, Borgelt Law ( www.borgeltlaw.com/about the firm), is listed in "Best Law Firms" by U.S. News & World Report -- Best Lawyers®, placing it in the top 15% in the USA. He is licensed to practice law in Texas and admitted to practice before the U.S. District Court, Western District of Texas. He represents individuals, landowners, businesses, licensed professionals, suburban areas, political subdivisions and large institutions before state and federal regulatory agencies, the courts, local governments and the Texas Legislature -- with consistently favorable and unprecedented results. Mr. Borgelt brings an extensive background of leadership and engagement in the Central Texas business, political, civic and government arenas to his firm's represention of businesses, individuals, land and property owners, suburban areas, license holders, public entities and institutions. He is listed in Best Lawyers in America® and Texas' Best Lawyers. His firm, Borgelt Law, is ranked in "Best Law Firms" by U.S. News & World Report -- Best Lawyers®, the pre-eminent guide to the US legal profession and beyond. Prior to establishing Borgelt Law in June 2010, he held senior positions in Texas government and excelled as partner at a major regional litigation firm where he led an extensive administrative and regulatory practice focused on environmental, energy, local government, annexation, zoning and permitting, land use and property law matters. At the firm, he also provided ethics advising, campaign finance and election law counsel as well as experienced defense of Deceptive Trade Practices Act claims and advising on Texas Public Information Act requests. His law practice has received high profile media coverage for the past two years through representation of Homeowners United for Rate Fairness in the appeal of Austin Energy's rate increase to the Texas Public Utility Commission, which resulted in an unprecedented rate discount for Austin's suburban customers and cost the City of Austin $1.6 million to defend. Prior to entering private practice in 2006, he served for seven years in the Office of the Attorney General as Deputy Chief of the Consumer Protection Division and then as an Assistant Attorney General, actively defending consumer interests in the area of deceptive trade, and where he represented major public entities, including Texas A&M University and The UT System, in major gas and electric utilities matters which resulted in significant multi-million dollar savings annually for these institutions and the citizens of Texas. As Assistant Attorney General, he appeared frequently before the Texas Public Utility Commission, Railroad Commission and Federal Communications Commission in rulemakings and contested case hearings and appeals, often winning favorable rulings which furthered the Texas public interest and business climate. He began his law practice as a law clerk at the Railroad Commission in 1989 before becoming a national authority in pesticide law and policy matters as general counsel of a small state environmental agency. During these earliest years of his law practice, he worked extensively with state and federal regulators and legislative committees examining and resolving complex environmental policy and impacts, including that of NAFTA on states bordering Mexico. Mr. Borgelt is a Sustaining Life Fellow of the Texas Bar Foundation and has served several years on its District 9 Nominating Committee. He is a Founding Fellow of the Austin Bar Association, Texas Co-Chair of the Federal Communications Bar Association and a 20-year member of The College of the State Bar of Texas whose members maintain highest continuing legal education standards. He recently served the State Bar of Texas as chair of its Public Utility Law Section, and currently, is serving as Secretary of the Austin Bar Association Environmental Law Section. He has published and lectured extensively in administrative law, and in 2007, served on the Board of Directors of the Austin Bar Association while chairing its Administrative Law Section which has 400-member attorneys practicing in the public and private sector in Austin. He is active in the State Bar of Texas Administrative & Public Law, Environmental & Natural Resources, Oil, Gas & Mineral, and Computer & Technology sections and spoke on utility matters at the State Bar's Annual Meeting in Houston in June 2012 when serving as chair of the Public Utility Law Section. He was recently appointed to the Texas Department of Agriculture Structural Pest Control Advisory Committee and elected Chair of the Committee shortly thereafter, at its November 2013 meeting. Mr. Borgelt is active in the Christian Legal Society in addition to numerous current leadership positions and interests in the Austin community, including: President, Austinites for Action; Board Member/Past Chair, Citizens Against Lawsuit Abuse of Central Texas; Vice Chair, Travis County Republican Party; Executive Committee Member, Small Business Group of Central Texas; Chair, Austin Chamber of Commerce State Environmental Policy Group; Member, Austin Chamber of Commerce State Issues Innovation & Clean Energy Policy Group; and Member, Real Estate Council of Austin, where he serves on key advocacy committees and spoke on a panel on city politics for its October 2012 meeting at the Four Seasons Hotel. Mr. Borgelt attended UT as a National Merit Scholar. He earned a Bachelor of Arts Degree in Psychology from UT in 1984 before graduating from The University of Texas School of Law in 1988. He is a lifelong Austinite and a member of the UT Chancellor's Council, UT Littlefield Society and UT Longhorn Foundation. He and his wife, Mary Ellen, are active in the Austin community. © 2019 The Borgelt Report, All Rights Reserved.